(*) VOCALISTS: Madeleine Peyroux, Barbara Hannigan, Gregory Porter, Jeffrey Wright, Luciana Souza, Kurt Elling, Kandace Springs, Melody Gardot, Camille Bertault. This intriguing and highly original project seeks to do several things at once: first, and rather belatedly, to mark the 60th anniversary of Bird’s death (which fell in 2015); second, to weave his best-known tunes together into a biographical narrative; and third, to re-imagine the tunes as if their composer were alive and working in today’s musical context. Producer Larry Klein has achieved all of these things in terrific style, aided by the participation of the top tier of modern jazz singers and players, along with a new collection of lyrics by under-the radar songwriter David Baerwald. One of many bold moves was to use the musicians from David Bowie’s Blackstar album: saxophonist Donny McCaslin, guitarist Ben Monder and drummer Mark Guiliana, plus Craig Taborn on keys, and either Larry Grenadier or Scott Colley on bass, with the ubiquitous Eric Harland as second drummer alongside Guiliana. Two tracks feature the actor Jeffrey Wright as Parker himself, and a couple more are instrumentals, but the rest are divided up between singers – all of whom do a magnificent job. Take the opener – a vocal version of Ornithology (retitled Meet Charlie Parker) which dispenses with Jon Hendricks’s hipster lines and reimagines the song as a hymn to the sexual attraction of Kansas City’s finest, aided by the soft, smoky voice of Madeleine Peyroux; meanwhile the uptempo swing of the original has morphed into a loose Freddie King-style vamp. Later, Gregory Porter takes on Yardbird Suite (retitled A Genius in his Youth); again, the tune has been freed from its bebop straightjacket and dressed in a modern suit of clothes, with a meandering, almost arrhythmic accompaniment; Kurt Elling’s contribution - Moose the Mooche (AKA Los Angeles) - gets a similar treatment, Elling purring and chuckling his way through the lyric as McCaslin and Taborn trade oblique licks. Some will bristle at the liberties Klein and his colleagues have taken with Parker’s music. But for my money, this is a wonderful reinvigoration of the canon. Slowing a lot of the material down and giving it brand new, well-crafted words allows Parker’s melodies to shine through afresh. There’s also a pleasing contrast of styles here: Kandace Springs, for example, sashays sunnily through the familiar samba My Little Suede Shoes (AKA Live My Love for You), before Wright brings it all down to pavement level with his noirish nightcrawler version of Segment (AKA Fifty Dollars), his mumbling, growling vocal reminiscent of Tom Waits at his darkest. So many all-star projects are exercises in grandstanding, eliciting little more than shrugs from the listener. 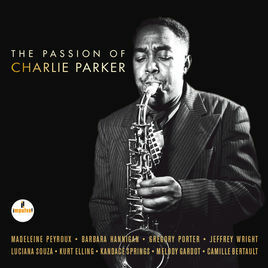 The Passion of Charlie Parker, however, is a fully integrated musical tribute, making one long to see it staged or screened as soon as possible. But for now, the pictures it creates in one’s head are vivid enough.